Disclosure: This post is sponsored by Walmart. 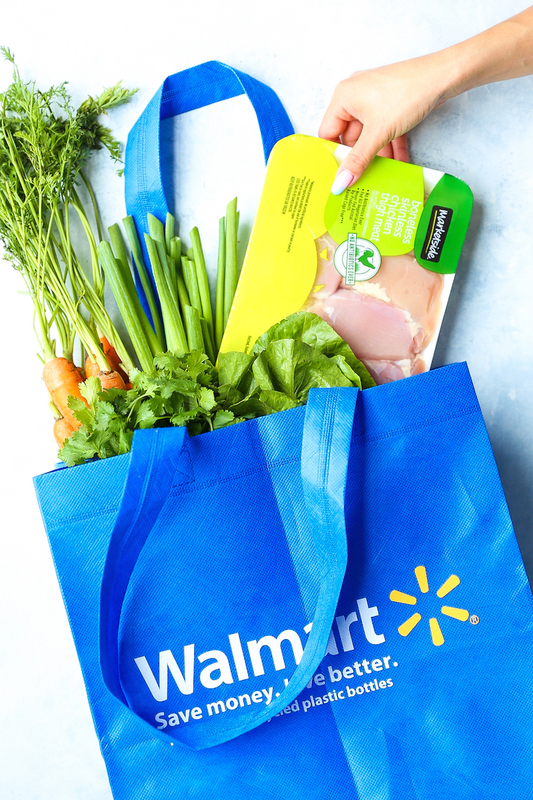 As always, I only partner with brands that I love and truly believe in, allowing me to create more quick and easy recipes to get us through the week without breaking the bank. All opinions expressed are my own. 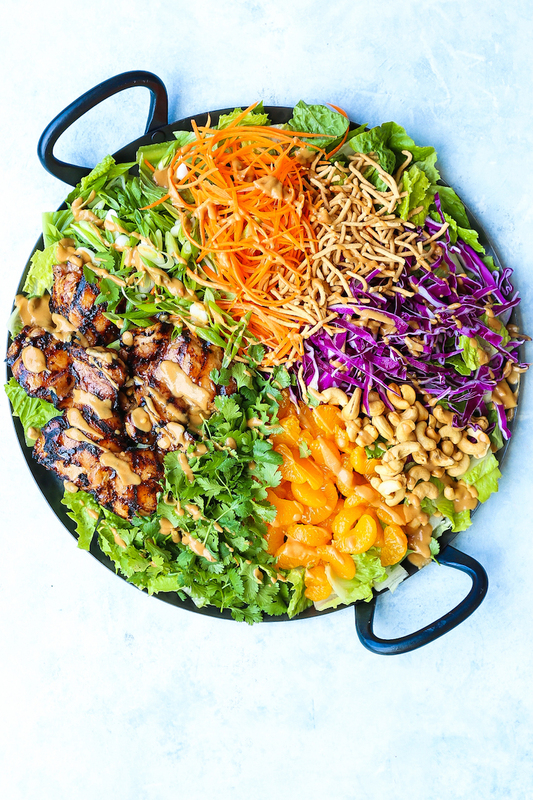 With perfectly juicy, tender teriyaki chicken and the most amazing peanut dressing ever! It’s quick, simple and perfect for a crowd! Now that we are smack-dab in the middle of summer, it can only mean one thing. It’s grilling season! And Walmart is the perfect resource to grab all of my summer needs. From their antibiotic-free chicken to their local grown produce, I can find everything I need for this gorgeous Asian chicken salad! The chicken is combined with a simple teriyaki marinade (homemade or store-bought is fine), which is then grilled to perfection. It’s juicy, it’s tender, and it’s packed with so much flavorful. Not to mention, it has the most perfect grill marks. Side note: if you don’t have access to a grill, you can use a grill pan on the stovetop but note that it will get super smoky! From there, we have all of our fun goodies – from the romaine lettuce to the shredded cabbage, carrots, cashews, cilantro, green onions and my two big time faves – chow mein noodles and mandarin oranges! It’s so stinking easy, you can serve this up for a large crowd for easy entertaining, or you can whip this up on any given weeknight! In a small bowl, whisk together peanut butter, soy sauce, rice wine vinegar, brown sugar, garlic and 1/4 cup warm water until smooth. Place in the refrigerator until ready to serve. In a gallon size Ziploc bag or large bowl, combine chicken and teriyaki sauce; marinate for at least 2 hours to overnight, up to 4 hours, turning the bag occasionally. Drain the chicken from the marinade. Brush with canola oil; season with salt and pepper, to taste. Add chicken to grill, and cook, turning occasionally, until chicken is completely cooked through, reaching an internal temperature of 165 degrees F, about 10 minutes. 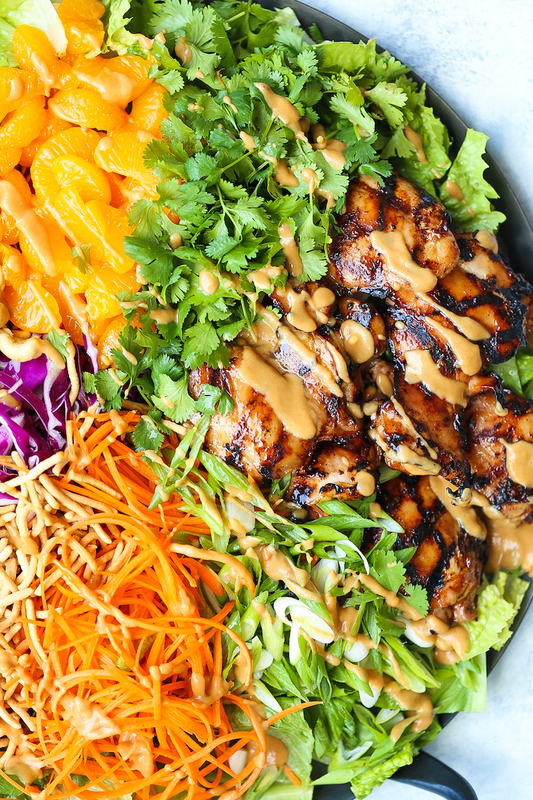 To assemble the salad, place romaine lettuce in a large bowl; top with chicken, cabbage, carrots, chow mein noodles, mandarin oranges, cashews, cilantro and green onions. Pour the peanut dressing on top of the salad and gently toss to combine. 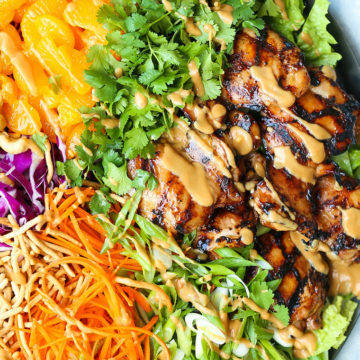 The post Asian Chicken Salad appeared first on Damn Delicious.